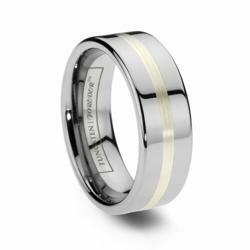 TungstenWorld.com expands its line of groomsmen gifts, bridal and wedding party accessories and cobalt chrome rings, as well as upgrading to Argentium® Sterling Silver inlay rings. Out with the old and in with the new. Tungsten World, a leader in online retailing of wedding bands and tungsten jewelry, announced it has upgraded to world-renowned Argentium Sterling Silver in all its silver inlay rings starting in 2013. In addition to the step-up in quality for their inlay wedding bands, the online source for all things wedding, has also added extensively to their line of groomsmen, bridal and wedding party gifts, as well as their ever-growing line of cobalt chrome wedding bands. Not to be confused with traditional sterling silver, Argentium Silver is a patented sterling silver alloy well known throughout jewelry circles around the world for it’s designer quality and luxury. Using the element germanium in conjunction with pure silver and copper, Argentium silver rings are purer, brighter and longer lasting than traditional sterling silver. Traditional sterling silver is an alloy consisting of silver and copper and for many years, sterling silver has been the benchmark for silver due to it’s 92.5 percent purity. However Argentium Sterling Silver not only tops this with a purity of 93.5 percent, its alloy has been independently tested to be brighter and whiter than sterling silver, platinum and even rhodium, which is used to give white gold its color. Combined with Argentium’s commitment and eco-friendly guarantee that all their silver is traceable and recycled, as Argentium puts it on their website, “If silver is the new gold... Argentium is the new silver.” Tungsten World will be utilizing the luxury benefits of Argentium Sterling Silver in all their silver inlay tungsten and cobalt chrome wedding bands starting this year. Read more about argentium on our website: Argentium silver vs Stearling silver. "When you’re looking for a luxury item like our inlay wedding bands, you want the best and the most exclusive. Argentium Sterling Silver gives our customers the purest form of sterling silver out there in conjunction with superior beauty and color," said Brett T., Tungsten World Chief Operations Officer. In addition to the switch from traditional sterling silver to Argentium Sterling Silver, Tungsten World has also upgraded their cobalt wedding bands selection and lines of groomsmen gifts (including cufflinks, moneyclips, pendants, watches, bracelets, etc) and bridal party gifts to start the new year at TungstenWorld.com. New styles in durable cobalt chrome featuring not only Argentium Sterling Silver but also platinum, rose gold and mokume gane inlays, as well as solitaire and multiple stone cobalt wedding bands, including channel set diamond cobalt rings, are now available online. And with a selection of bracelets, pendants, earrings, money clips and cufflinks added just before the holidays, a further selection of heart-inspired jewelry and great gifts under $50 have been added for customer’s one-stop wedding shopping and Valentine’s Day Specials needs. "The demand for both cobalt chrome wedding rings and great accessories for groomsmen gifts or even special occasions like Valentine's Day has been growing," said the Tungsten World COO. "We pride ourselves in having a variety of styles no matter what the customer is looking for. And if we don’t have it, we'll find it."